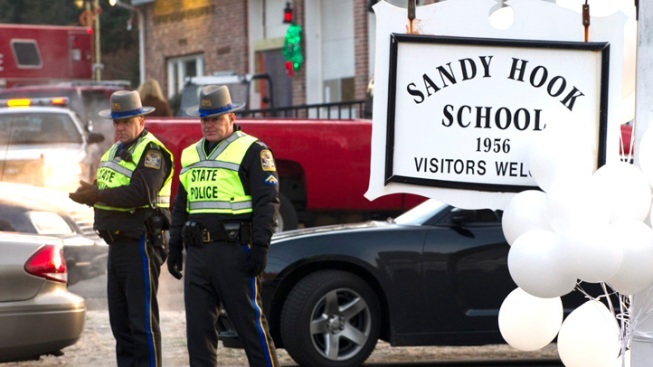 Police stand guard at the entrance to the Sandy Hook School on December 15, 2012 in Newtown, Connecticut. Connecticut officials say they're seeing potential security problems at schools across the state, even after the Newtown shootings in December and subsequent efforts to improve safety. State police officials say they've found propped-open doors at most of the 75 schools they've assessed for security, as well as other problems including cluttered hallways, open janitor closets full of cleaning chemicals and overgrown bushes blocking views of school grounds. State counterterrorism officials described their findings Wednesday at the annual Connecticut Emergency Management Symposium in Cromwell. They urged school officials to work with local and state law enforcement to take simple, inexpensive steps to improve security, including fixing old doors. Twenty first-graders and six adults were shot to death at Sandy Hook Elementary School in Newtown on Dec. 14.